BJP legislator from Bokajan Numal Momin on Wednesday came down heavily on Krishak Mukti Sangram Samiti (KMSS) leader Akhil Gogoi and said the latter has been following the dictation of AIUDF chief Badruddin Ajmal. Addressing media here, the BJP MLA reaffirmed his party’s stand on Citizenship (Amendment) Bill, 2016. At a time when the Bill has been opposed by most of the organisations and political parties in the Brahmaputra Valley, allowing immigrants from Bangladesh to seek citizenship in India, Momin said the Bill, if passed would help stop infiltration from Bangladesh. and accused Gogoi of shouting more on the issue to make Ajmal the next chief minister of Assam. “A person who has close link with Bangladesh origin leader pretends to be peasants’ leader which is a good joke ever. The main objective of Gogoi is to hamper the progress of development in the state and he is doing that on Badruddin’s dictation,” Momin said. He asked Akhil Gogoi to utter ‘Joi Aai Asom’ if he has the courage instead of clicking photo with people who utters ‘Pakistan Zindabad’. Moreover, Momin challenged Gogoi to contest panchayat election against BJP if he has courage. Momin also said that the pamphlets distributed by KMSS and other organisations to make aware the people on the rumours spread by BJP on Tuesday were itself a rumour. “It is not BJP. It is Gogoi, who has been spreading rumours on Citizenship (Amendment) Bill 2016. BJP has been trying to make people understand about the facts behind the bill,” Momin said. Momin asked Hazarika to come with facts if he has any proof. 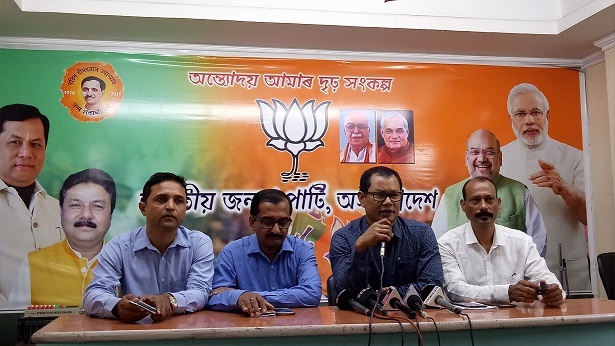 Meanwhile, state BJP minority wing chief Syed Mominul Awal termed Akhil Gogoi as ‘Supandi’ (a famous character of Tinkle, a comic book, who amuses everybody with his stupidity).